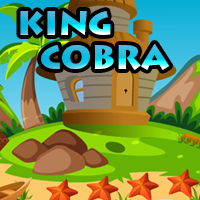 AvmGames - Avm Escape King Cobra is another point and click escape game developed by Avm Games. You remembered just liking books when you were younger. You never remembered enjoying researching. However, as you grew older, you found some more interesting subjects. And you slowly came to love learning more about those things. Your ways included visiting the library and pulling out numerous books at once. You didn't get to read all the books. So you would sometimes spend more time returning them than being able to read them. You just told yourself that this was all part of a process. But your most favorite part was visiting the site itself. You felt like a new adventure would always be ready to greet you. Then again, it seemed like when you were looking for it, it wouldn't appear. But when you didn't prepare for anything, it would greet you head on. Sometimes, you felt like it would win over you. Yet you always pull through. Just like the day you found a King cobra inside a cage. You just felt that all animals should be out of their cages. They were created to be free and not to be gawked at behind steel bars. So you decided that instead of just focusing on your research, you'd also find ways to get the King cobra out. Good luck and have fun! dammit cant get pink number to work?? alpha red is top to bottom as I recall..
LOL trying to use colour clue now..
now 2 items are sitting again in first inventory slot for me...! & now I have 2 papers one over the other & can't select about item for both of them...! AO, you are talking about this? I am tring to catch up one moment working on Blue # ? Anyone remember the Blue # it won't work for me?? Well I can't finish as every thing I have is piled in top slot of inventory ?? I was getting stuff then it stopped . Ohhh! Combine coloured arrows with coloured number chart! I got red and pink kinda by accident! Gotta run now, will finish later.